Have newly chosen to shoot traditional or technical barebow archery without a sight; they have no idea yet how to “gap shoot” or are new to string walking, etc. I decided to create guidelines for a Traditional Field Archery Round that makes more sense for the short distance practitioner and establishes a standardized round for friendly competition and skill progress tracking. Sure, you can just go out and wing it, but if you want to score it with a reasonable semblance of how it all works normally, this is good training. If you are an experienced Field Archer, this can be a walking course workout where you focus on form (that’s how I use it!). In order to do this, one needs to start from the farthest stake for a given target and walk forward if necessary until the target size can be identified and see if there is a stake (of any color) at the required distance for that target. If not, one needs to walk a number of “paces” in front of or behind that stake to get to the required distance. For example, you get to a 65 CM target and the nearest stake to it is 20 yards, but there is also one at 40 yards – simply stand as close to the middle of those two stakes as you can estimate. It would be a good idea to practice how many “paces” you need to walk for marking off 5 yards and 10 yards, etc. Target size identification is only potentially difficult for the 50 CM and 65 CM targets; the 35 CM target is almost always one of four targets on a bale, and the 20 CM “birdie” targets are always in four vertical columns of four targets. To make sense of the downloadable conversion charts, remember that the Hunter Targets are the black targets with white spots meant to be shot from the red stakes. 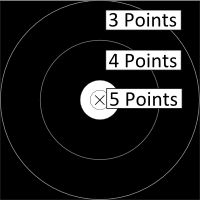 The Field targets are the white targets with a black 3 ring and a black spot meant to be shot from the white and/or blue stakes. 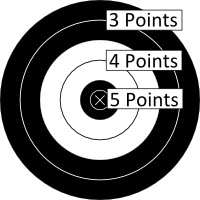 Target scoring is as follows – four arrows per target, 14 Hunter targets and 14 Field targets for a total possible 560 points. My hope is that this will catch on more broadly – I would ultimately like to maintain an ongoing digital leader board where people nation wide can submit or upload scores themselves.